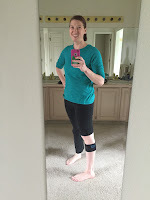 I have been given a Quell Relief device as part of a product review through the Chronic Illness Bloggers network. Although the product was a gift, all opinions in this review remain my own and I was in no way influenced by Quell. As stated in my product review policy, my reviews will always be honest. I first heard about Quell in a Forbes article. According to Forbes, "the Quell is an FDA-approved wearable device that Velcros around the upper calf and uses electrical stimulation to purportedly offer pain relief without the innate dangers or risks of addiction that come with drugs." While I don't love the implication that drugs are necessarily dangerous and should be avoided, because I know I would not be able to function without the use of medication, of course I would love to reduce my reliance on so many medications if possible. So Quell sounded promising, and when I was given a chance to try the device myself I accepted immediately. The science behind how Quell works is fairly complex, but the short version is that by stimulating specific nerves a natural pain-relief process can be activated. There is some scientific evidence to support this claim - one study showed that 81% of Quell users reported improvement in their chronic pain. However, it is important to note that this study was conducted by the company who makes the Quell device. It would be really nice to see some more third-party research on the science behind this device - especially to help justify the rather significant investment in the product. When my Quell arrived, I used the quick start guide to figure out how to attach the electrode and then place the device on my calf. The electrodes attach to your skin with sticky gel and the device Velcros on in a little pouch. Then it was time to calibrate, and I have to admit to feeling a bit nervous during this process! Was it going to zap me, I wondered? But really it was just a slight tingling sensation. In the end it felt like TENS devices I've used before at physical therapy. After using the quick start guide to get my Quell therapy session started, I decided to download the app to my phone and have a look at that. Quell uses Bluetooth to sync with an app you can download for free from the App Store or Google Play. The app allows you to monitor your therapy sessions and change the intensity if you want. However, one thing I wish I had known in advance is that to pair your Quell and your app you need to have the last two digits of your device's serial number - and if the device is already strapped to your leg providing therapy that number is inaccessible. So you may want to pair your Quell and app prior to starting therapy if you want to make use of the app. There are a couple of things to keep in mind if you are considering trying Quell. For one thing, it is somewhat wardrobe limiting - especially for girls who tend to have tighter pants that the Quell won't fit beneath. So I either wore loose pants, shorts, or a skirt. I feel like this would be more of a challenge in the wintertime, but one solution to would be to just use Quell around the house or at nighttime. I also don't love that you are supposed to replace the electrodes every two weeks, because that's an additional $90 every three months in addition to the hefty initial investment. But I do like that the device was comfortable to wear - and it's great that the battery lasts a few days so you don't have to charge it every day. I have to admit that at first I found the tingling sensation very distracting as I tried to go about my day. But, after a couple of days of use, it was a lot less distracting. And when I did notice it was almost comforting to know that I was doing something proactive to help reduce my pain. And now the $10,000 question: did it help? Honestly it is a little bit hard for me to know for sure. There are so many variables that go into how much pain I feel from day to day, and it certainly did not take away my pain all together. But, that being said, my trial of the Quell did coincide with a difficult period of transition for me. Although Rituxan has turned out to be a really great medication for me, unfortunately I was unable to last a full six months between doses. So while my rheumatologist and I worked to reduce the time between my infusions, I ended up taking a fair amount of prednisone - the drug we all love to hate! In fact, I've been on prednisone pretty consistently since the birth of my second son, which was almost two years ago at this point. I started using Quell right after my most recent Rituxan infusion, and with my next infusion scheduled for just five months away I was in the process of trying to wean of prednisone permanently. Those of who who have been through this weaning process know that it is neither easy nor pleasant! It took several weeks, but I have been able to wean off prednisone almost completely. And I did really appreciate having access to another form of pain relief during that process. I'm not sure if I will use Quell regularly due to the cost of buying new electrodes, but I am happy to have it on hand as another option for times when I am struggling more than usual.